Photography at Bedern Hall in York is fantastic - I love the old medieval building, a hidden gem in York! Sharon and Nick's wedding was fab! Ceremony and reception were both at Bedern Hall. It is such a beautiful venue, very church like, without being a church! The interior is stunning. The rain had been torrential on the morning of the wedding, and it was still raining when Sharon arrived. It was not a problem, we got some lovely shots of her sitting on a beautiful old chair in the back room! After a lovely ceremony, the weather was luckily fine, so we did the group shots in the courtyard. Sharon and Nick didn't want many group shots - which I prefer as it gives me longer to spend with the bride and groom, as well as getting more candid shots. 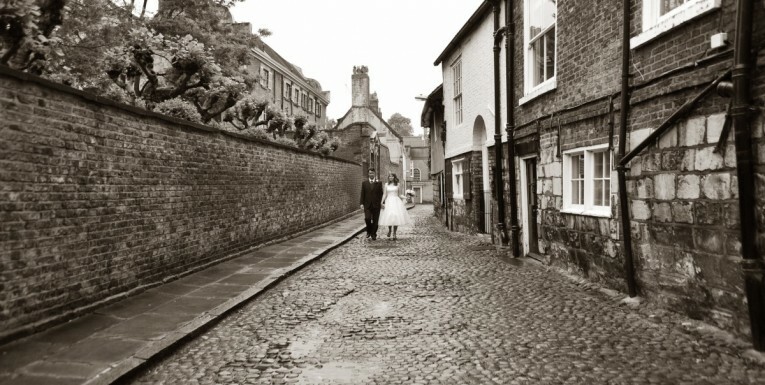 We were able to go to The Minster Gardens for photos, with a stop off at my favourite York street next to The Treasurer's House. Everywhere under foot was wet, and it gave a lovely feel to the photos, especially on the cobbles. Back to Bedern Hall, and the rest of my time was spent getting the informal shots, as well as beautiful details of the tables set up and flowers. Another fab wedding! Wedding photography in York is amazing, and photography at Bedern Hall is particularly special to me. From the moment I went with Nikki she made sure she knew exactly what I wanted, nothing was too much trouble. Nikki listened to all my ideas and was able to guide me in the right direction in terms of what would and wouldn't work both with the wedding day and the wedding album. On the 'big day' Nikki was patient, unobtrusive and I can honestly say made the whole photographic experience fun. She has been an absolute star with the patience of a saint. I plan to use the company again for other upcoming events.